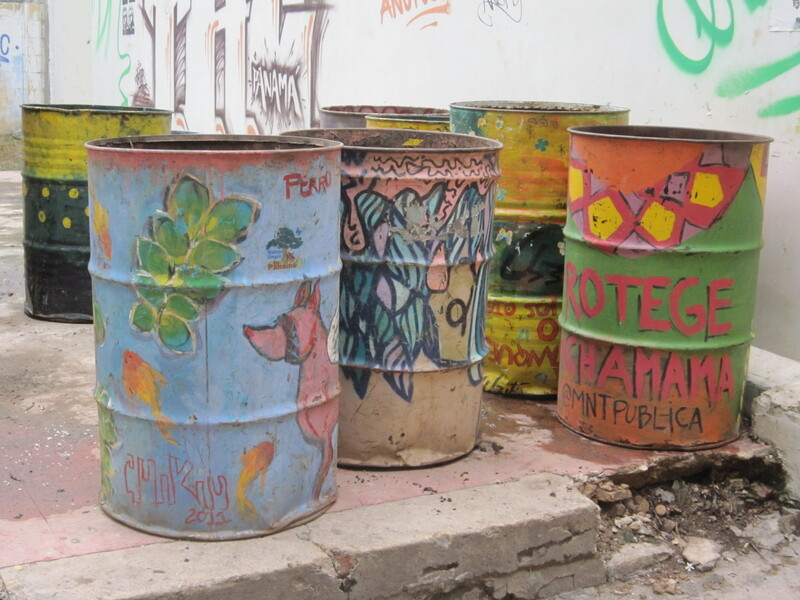 For my third day I planned an overnight trip to the mountain town of El Valle. Before checking out of my hotel, I went for my morning constitutional around El Congrejo. 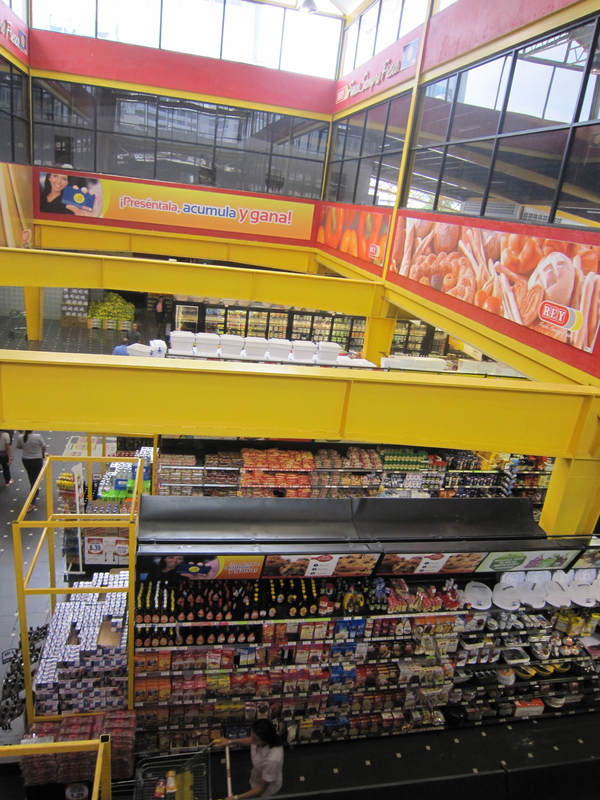 I was curious to see a Panamanian super market, so I stopped in the mega store El Rey. It was surprisingly similar to an American supermarket. 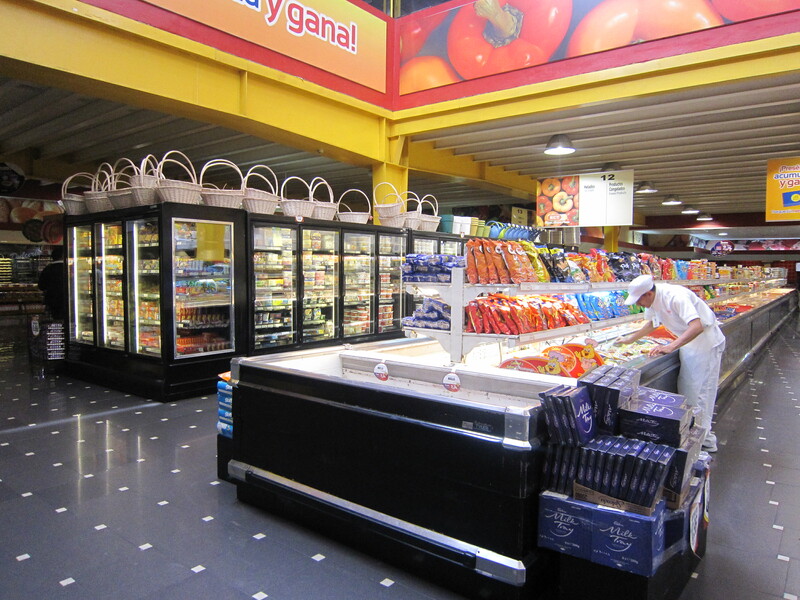 Almost all of the frozen foods and packaged products were from American companies. Some even had English labels. The most glaring difference from an American supermarket was the armed guard at the entrance who shouted at me to stop taking photos. 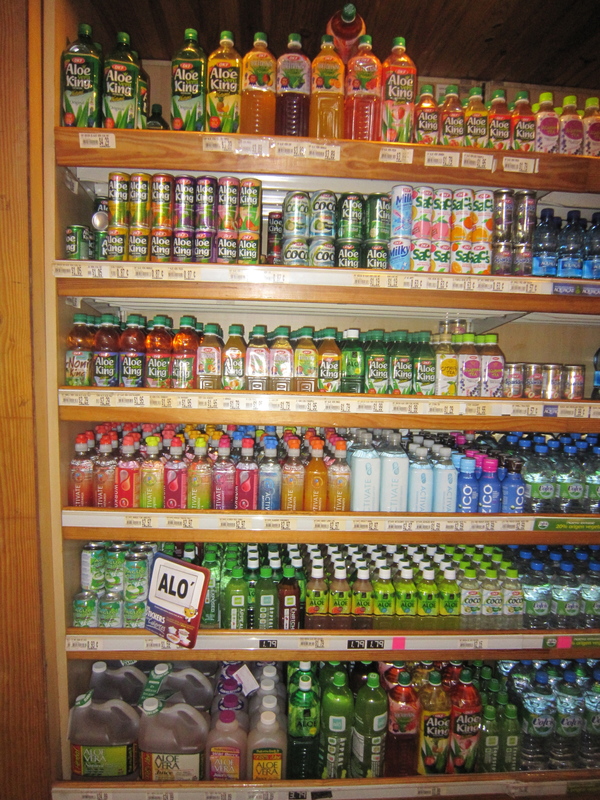 Inventory-wise, the only noticeable difference (from my brief assessment) was the huge variety of aloe drinks. I was also impressed with the large health food selection, which even included my favorite German Mestemacher bread. 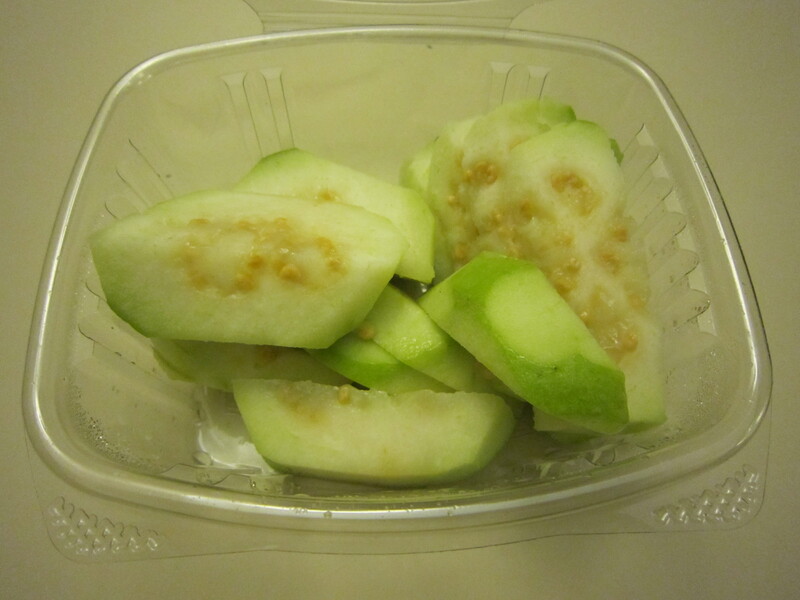 I bought green guayaba (guava) fruit because I had never seen it before. It was delicious! I took photos of some interesting buses around the neighborhood. 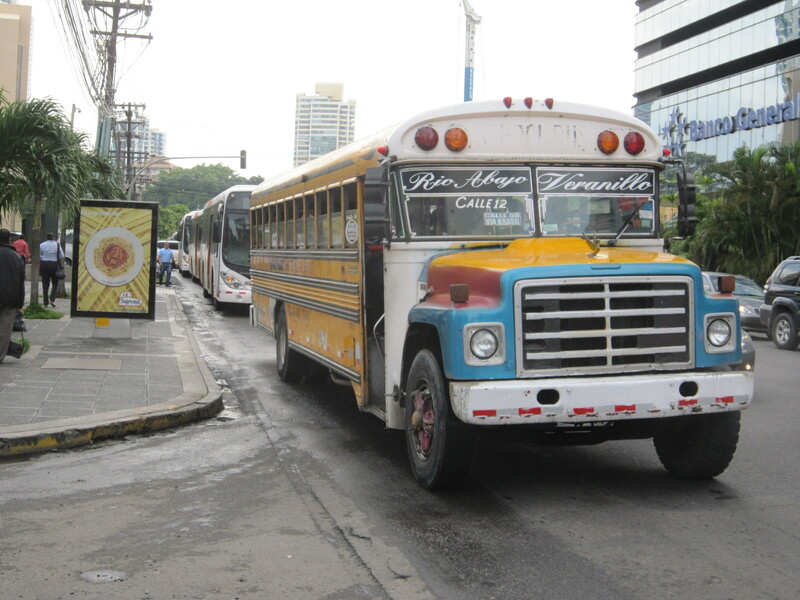 In Panama City, the older public buses are former American school buses, and many of them are painted with images ranging from Jesus to naked ladies. 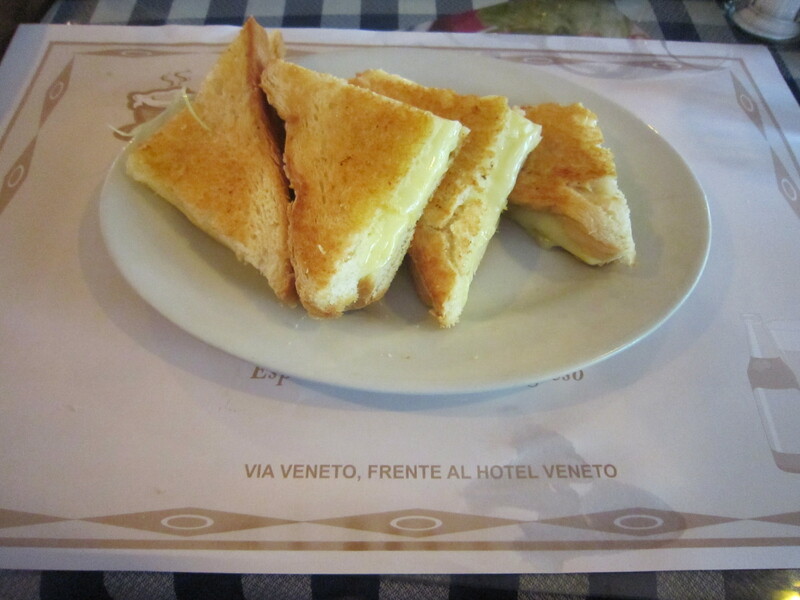 I checked out of my hotel and then went for a casual lunch at a diner called Cafeteria Manolo’s, which is across from the Veneto Casino. Manolo’s is considered the place to see all walks of life, from casino prostitutes to businessmen. It’s also known for being inexpensive. 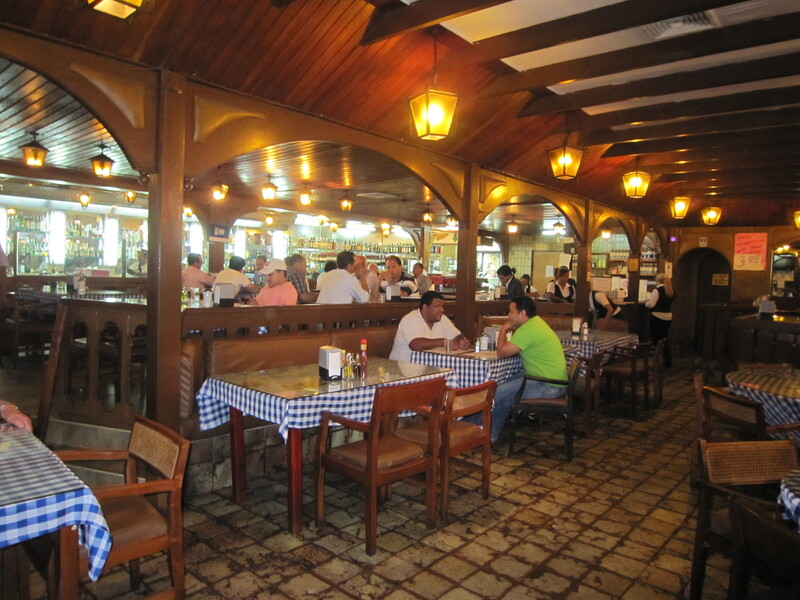 The interesting people watching, old-fashioned decor, and typical Panamanian menu made it my new favorite restaurant. I didn’t know what to expect from a $2. sandwich, but the grilled cheese I ordered was huge and very good, as was the house salad. 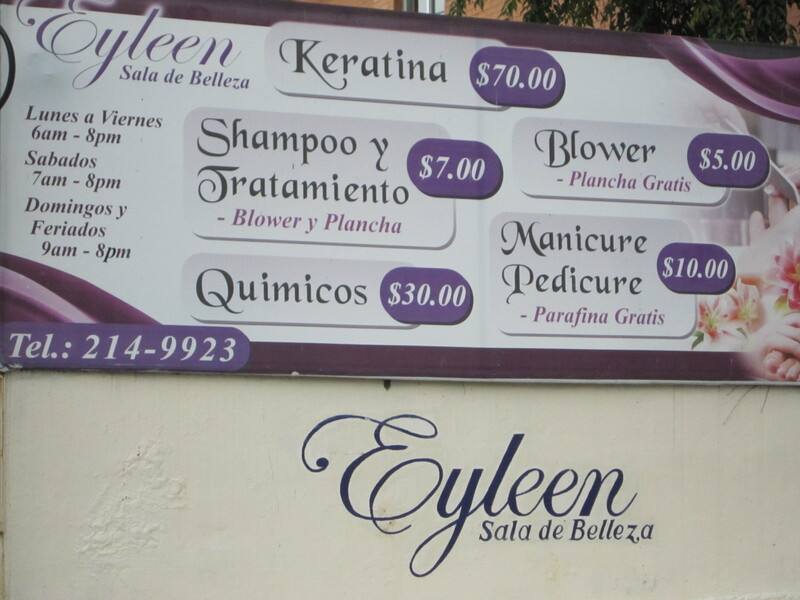 This is a short post, but stay tuned for a New York fashion post and photos of my trip to El Valle! After my excursion to the Gamboa Rainforest Resort, I asked my driver Luciano to drop me off at Panama City’s fish market, El Mercado de Mariscos for a late lunch. 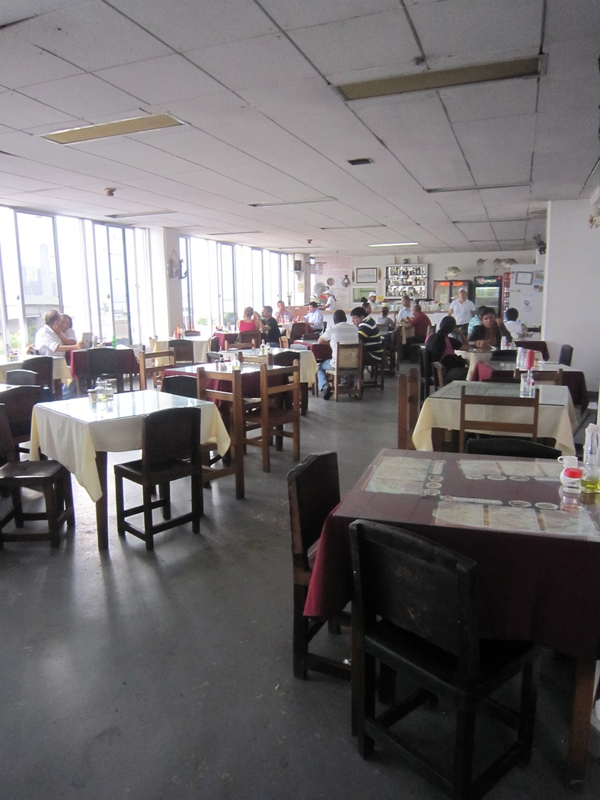 I had read in my guidebook about the top floor restaurant, which naturally has the freshest seafood in the city. 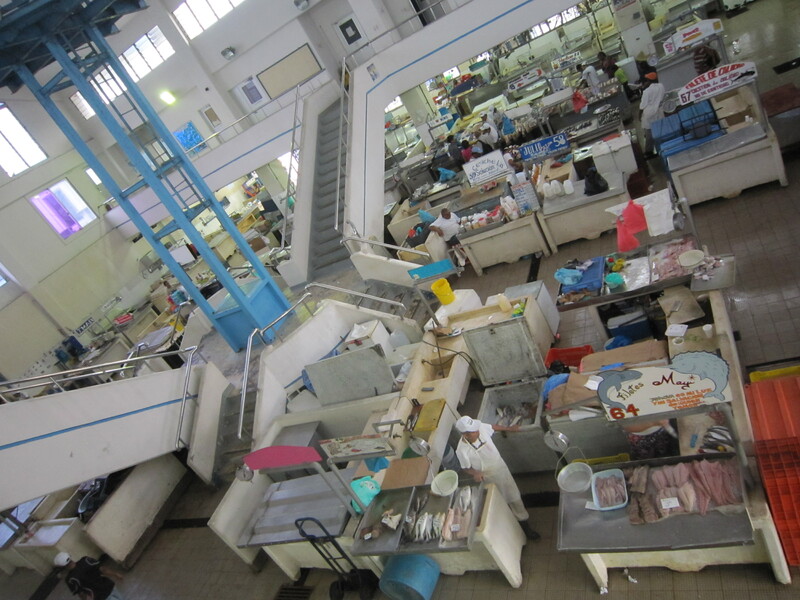 Upon entering the market, I was overwhelmed by the fish smell and afraid I wouldn’t be able to make it through a meal there, but very quickly adjusted to the stench. 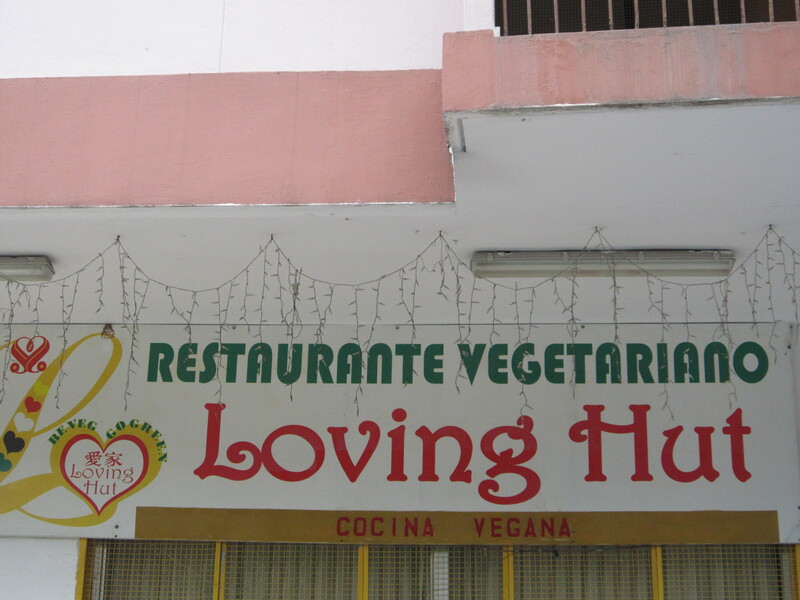 The restaurant overlooked the below market. I ordered a plate of mixed seafood, which came in a tomato sauce. It was OK, but the sauce was a little too salty for my liking. 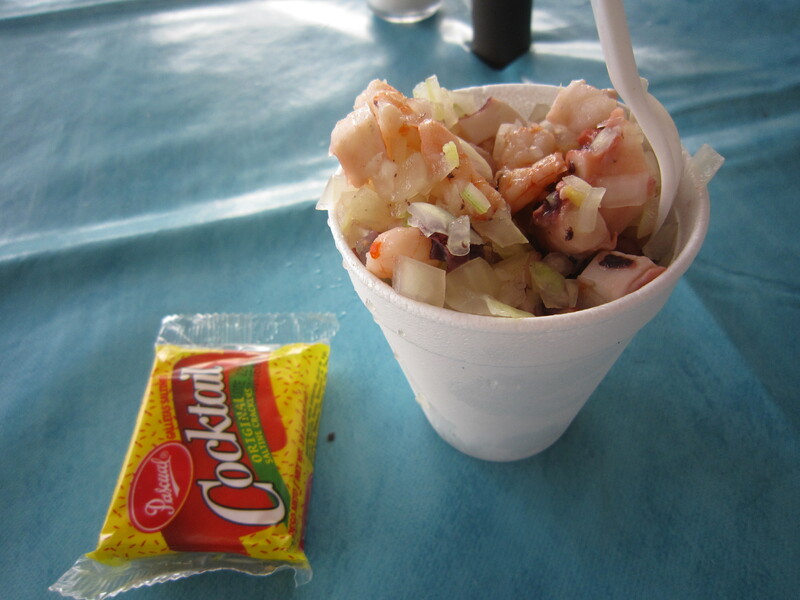 On my way out, I stopped at one of the many stands outside the market and bought a cup of ceviche for $2.25, which was outstanding. 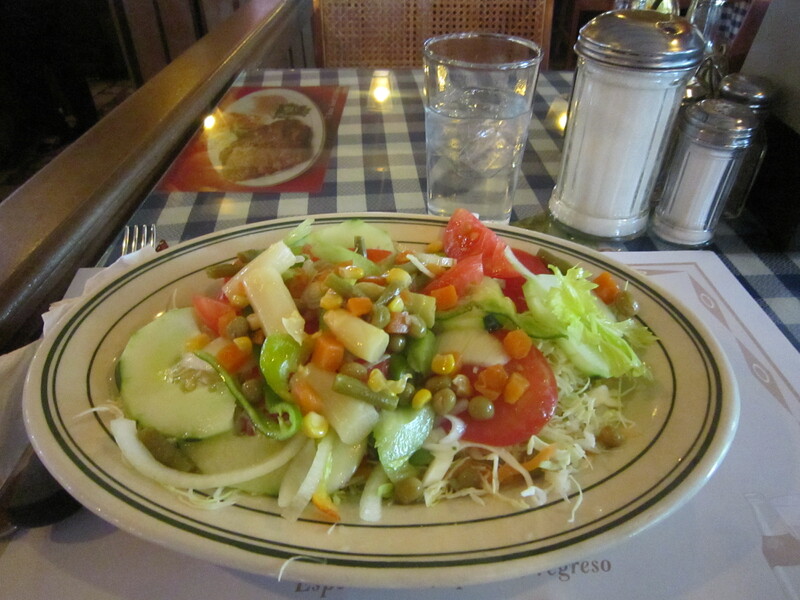 If I was to do it again, I would try several types of ceviche at the different stands instead of eating at the restaurant. 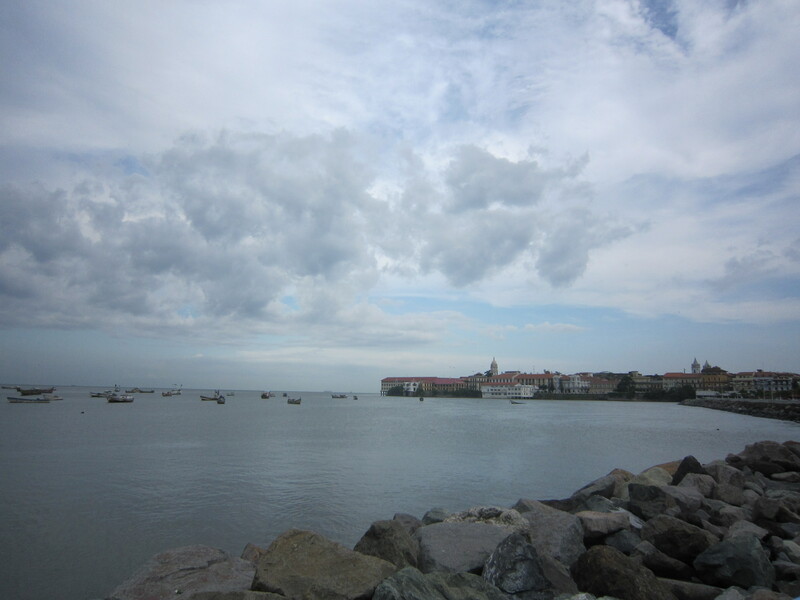 I walked along the waterfront from the fish market to Casco Viejo, which was just a short distance with lovely views. 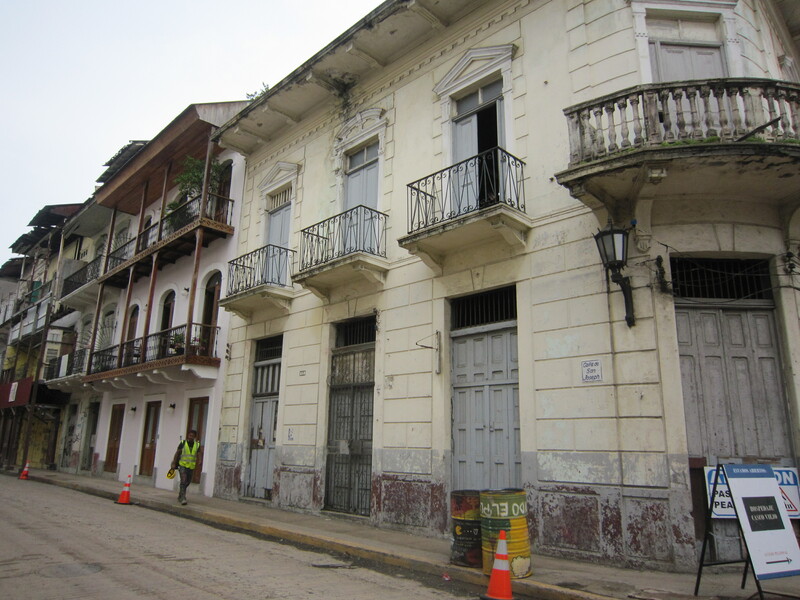 I wanted to further explore Panama City’s historic neighborhood, Casco Viejo, since I only saw it briefly on my historic trolley tour. As mentioned previously, I found the area to have a very strange vibe. 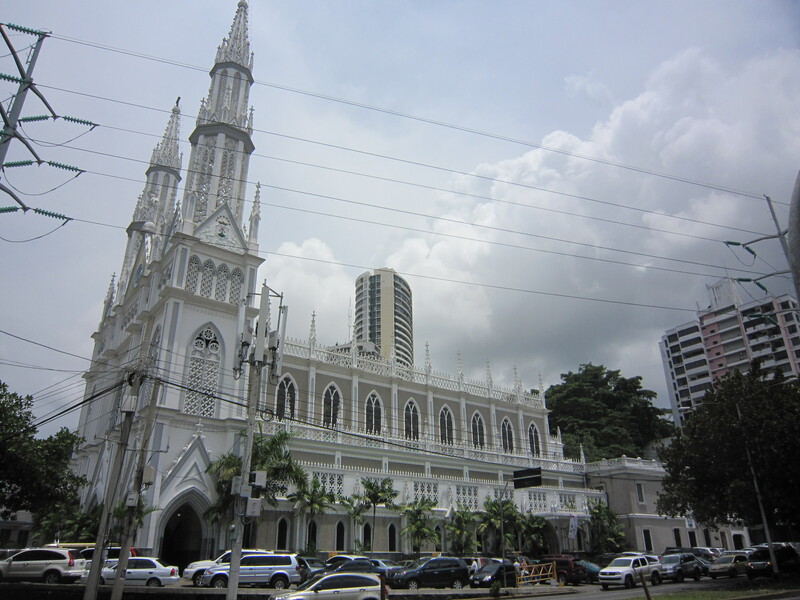 The lovely French and Spanish colonial architecture is reminiscent of New Orleans and Cartagena, but the area is undergoing major transition. 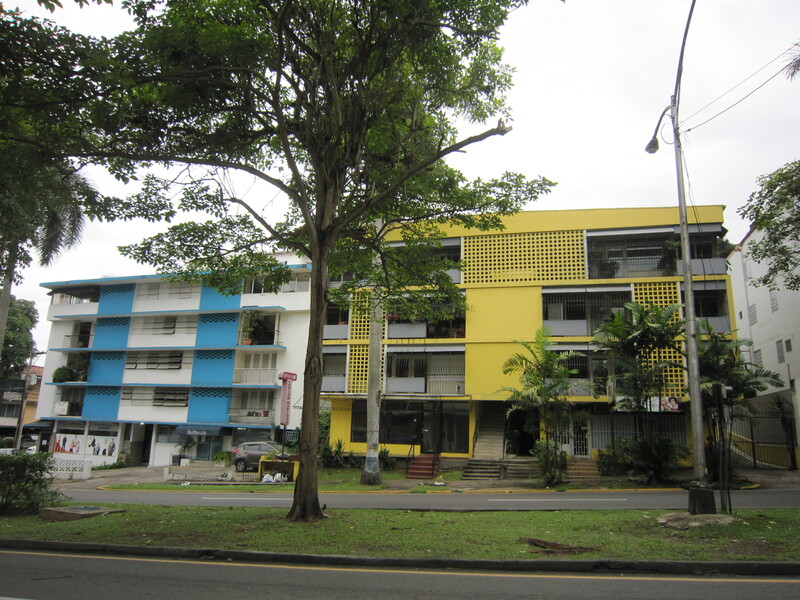 Many of the buildings are owned by foreign investors and are being renovated, but there is still at least one dilapidated building on every block. 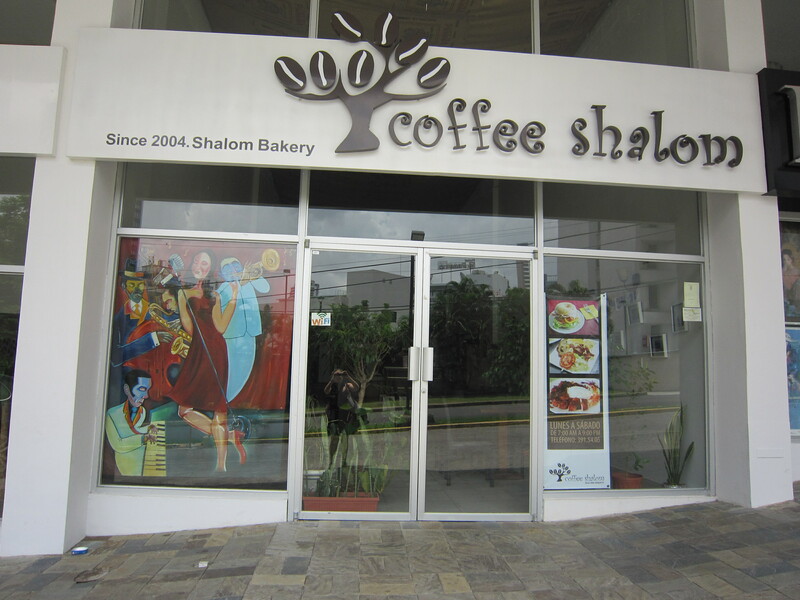 There are upscale hotels, boutiques, and restaurants, alongside rundown homes with squatter-ish looking people lingering around. 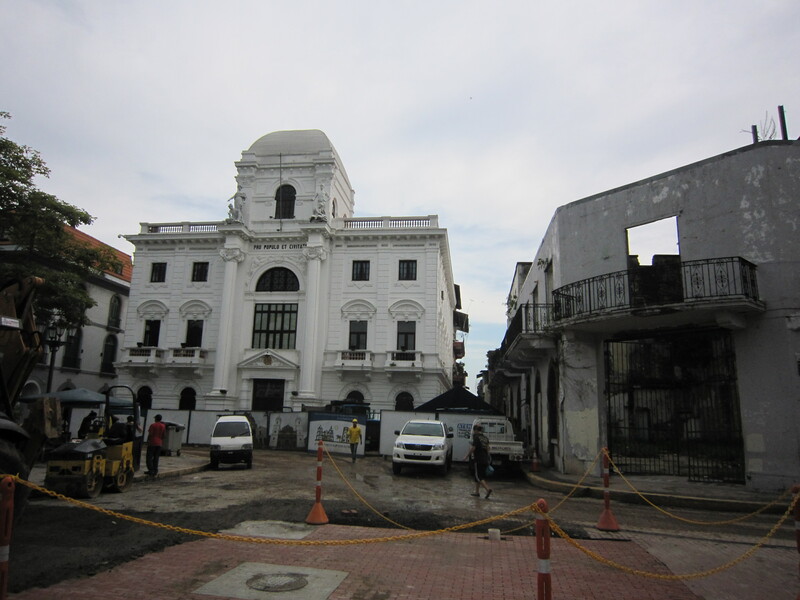 Casco Viejo is a big tourist attraction and the location of the President’s Palace, so there is a strong police presence. 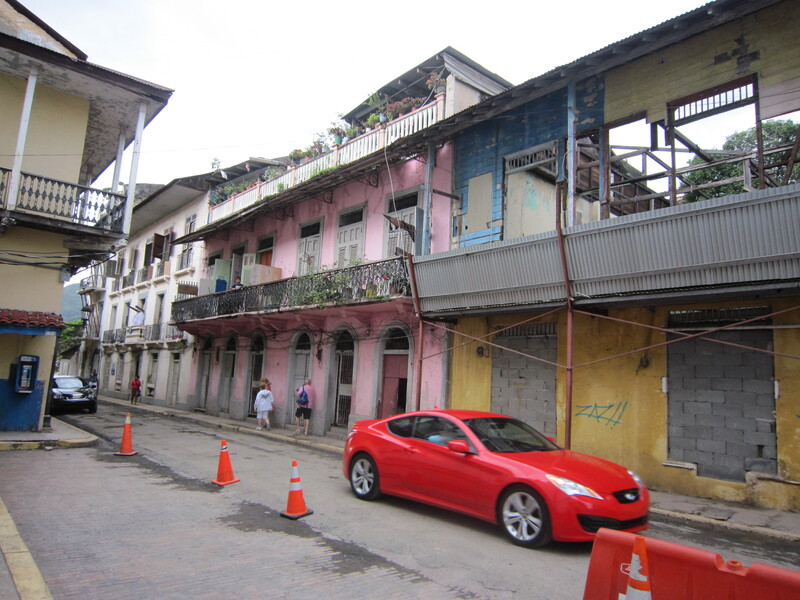 However, Casco Viejo also borders three of the poorest neighborhoods in Panama City and until those areas receive aid, I think the district will remain dicey. I tried to photograph some of the charming architecture, but there were literally construction projects on every block, which took away from the picturesque potential. 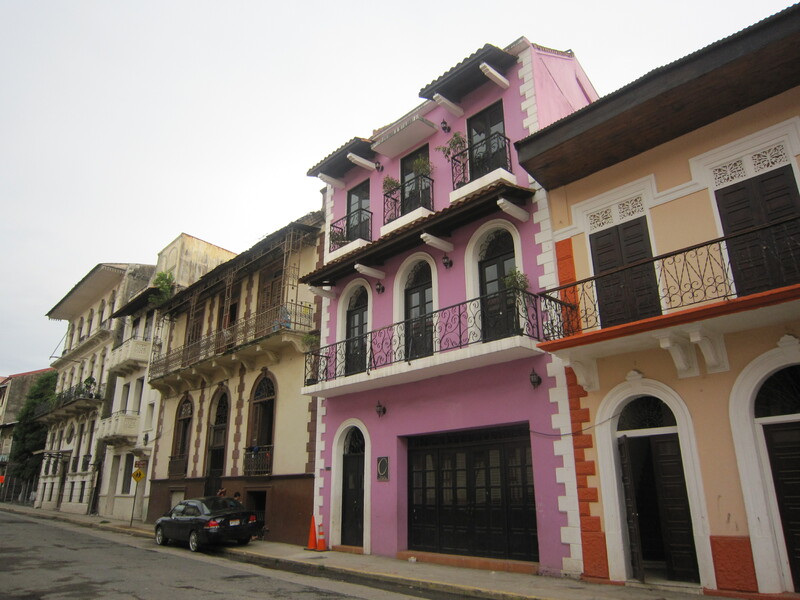 I walked around Casco Viejo for awhile and visited some cute boutiques. I liked the store Reprosa for reproduction pre-Columbian jewelry and Karavan Gallery for local design pieces, though the latter was a bit pricey. 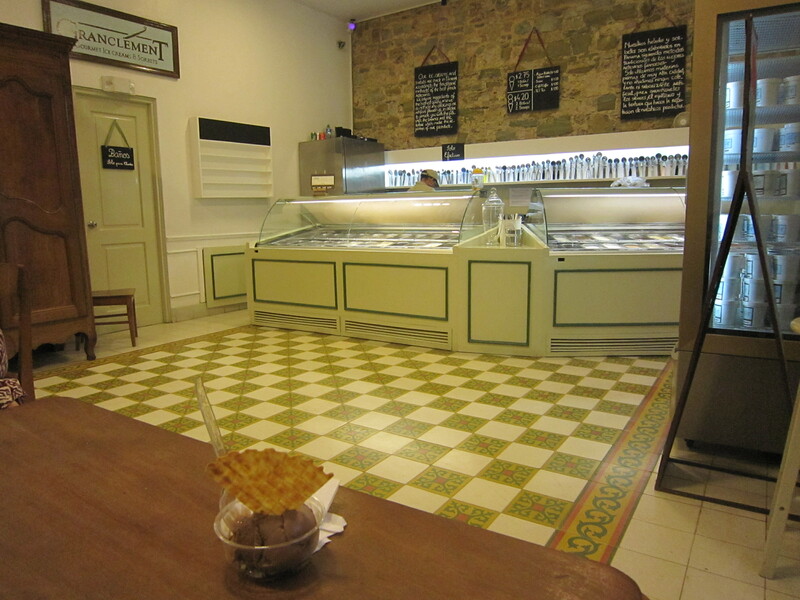 I also stopped at the much heralded French ice cream parlor, Granclement, which lived up to its reputation, but was difficult to find due to the construction project in front. Around 5PM I decided it would be a good idea to head back to my hotel before it got dark and I started the arduous task of finding a taxi. 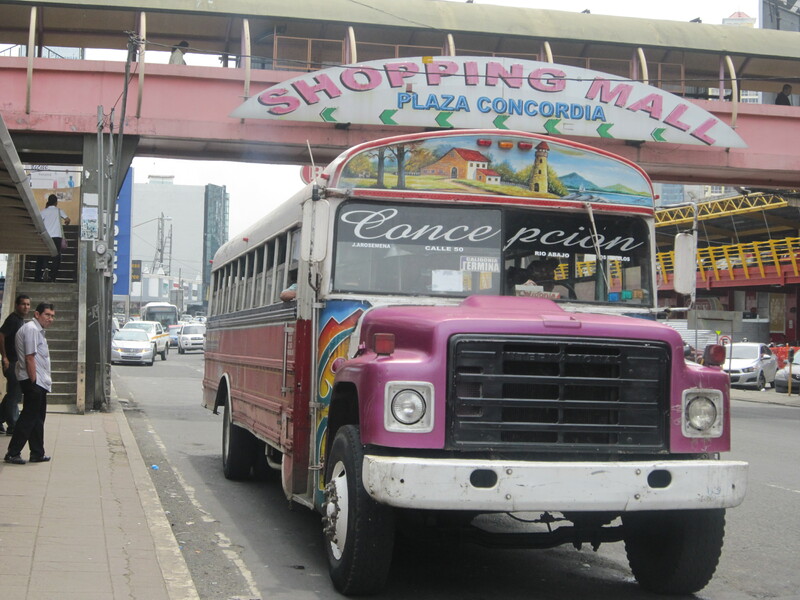 There are a lot of taxis in Panama City, but it could be challenging to find one around rush hour. 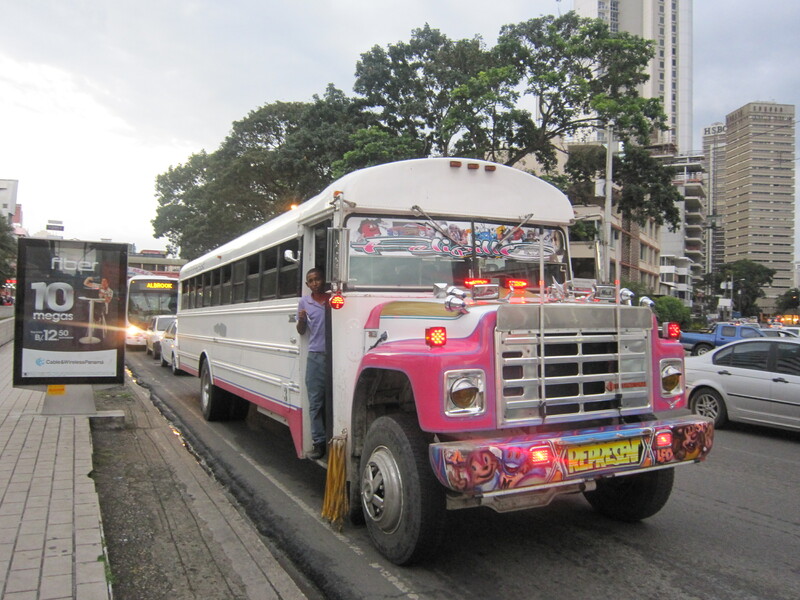 Another issue, which I experienced at heightened levels in Casco Viejo, is that Panamanian taxi drivers like to overcharge. 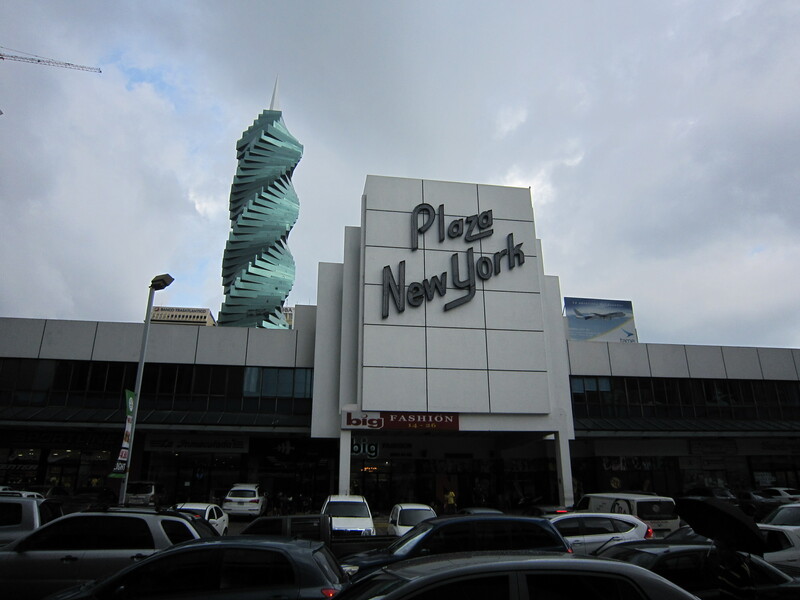 Taxi fares in Panama City are set by zone and should never be more than $2-3 dollars. I always asked the cost of a ride before getting into a taxi and usually passed on too-high rates. However, in Casco Viejo all of the taxi drivers were quoting me ridiculous fares ($8-10) and eventually I settled/bargained down to $5. because I was tired and just wanted to get out of there. 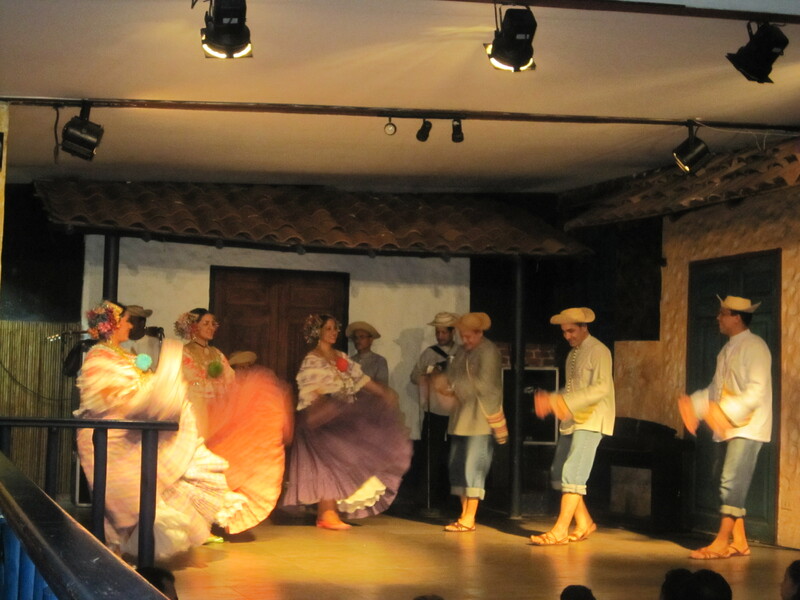 I went back to my hotel and rested before heading out to dinner and a folkloric dance show at Las Tinajas, which is one of the city’s most famous restaurants for traditional Panamanian food. 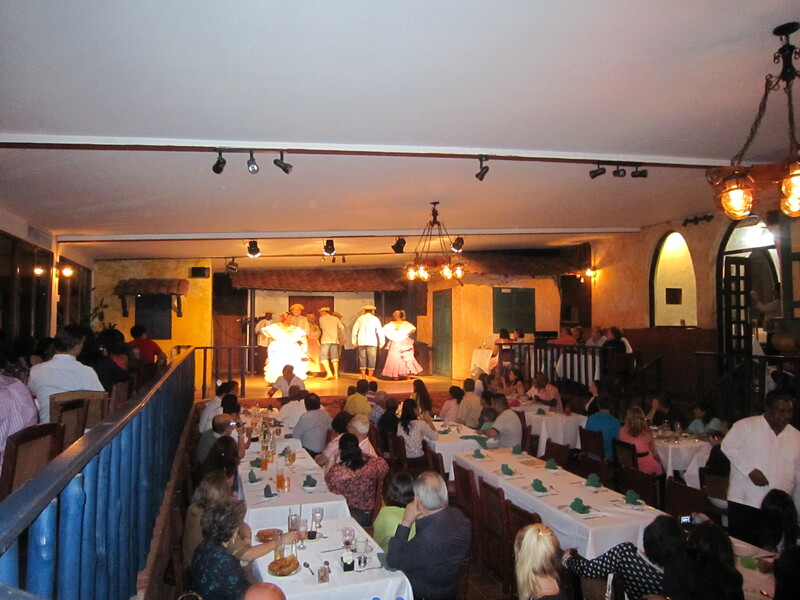 I had wanted to eat at Las Tinajas on my first night, but the dance show dining room was booked (note – you need reservations for the dance show, because it’s a popular tourist activity). 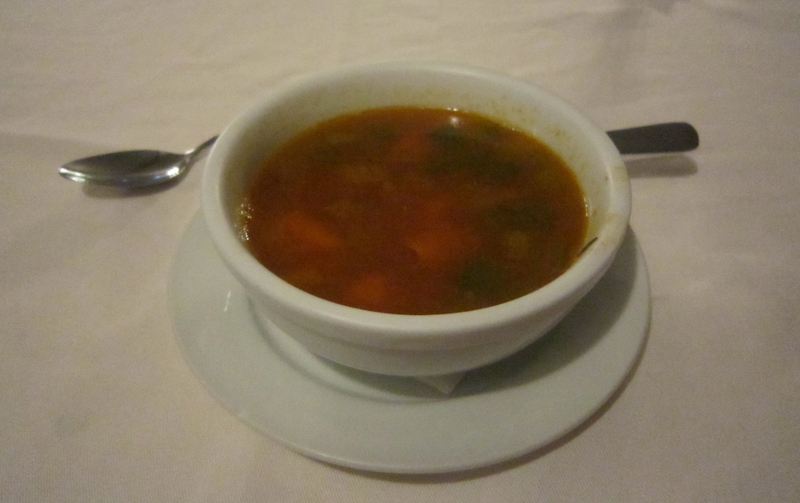 I ordered fish soup to start (in retrospect, this day could be called fish, three ways). For my entree I ordered the “typical plate,” which was probably not the best choice for me since I don’t eat ham/pork, but there was enough food so that I didn’t leave hungry. The plate featured a meat I don’t eat, rice and chicken, a grilled plantain, and an unidentifiable, but tasty side dish of orange mush with olives. 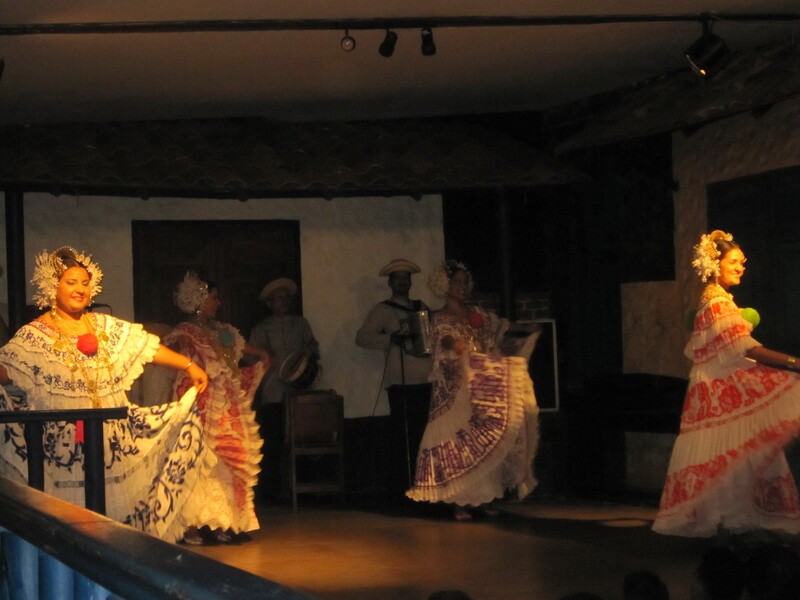 I enjoyed the folkloric dance show, which was fun without being too cheesy. 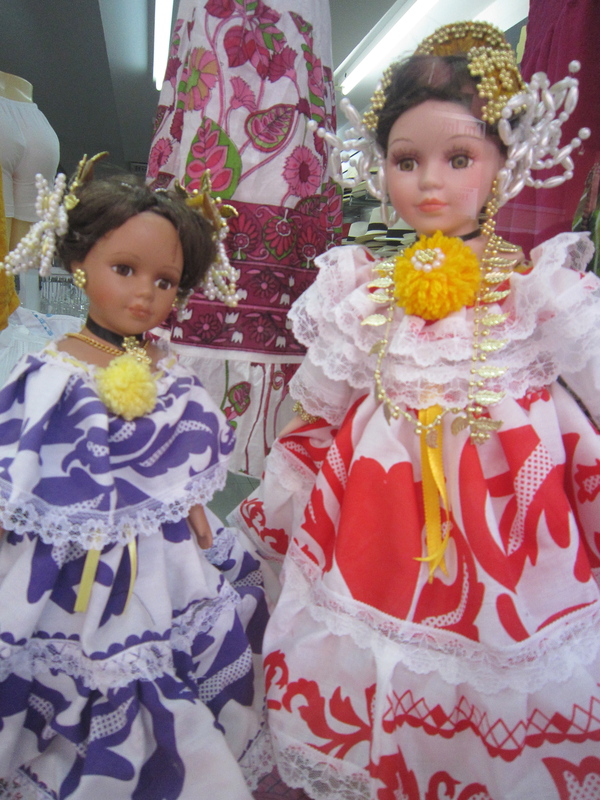 I especially liked the women’s traditional pollera costumes. After the show I headed back to my hotel room to prepare for my upcoming trip to El Valle de Anton. 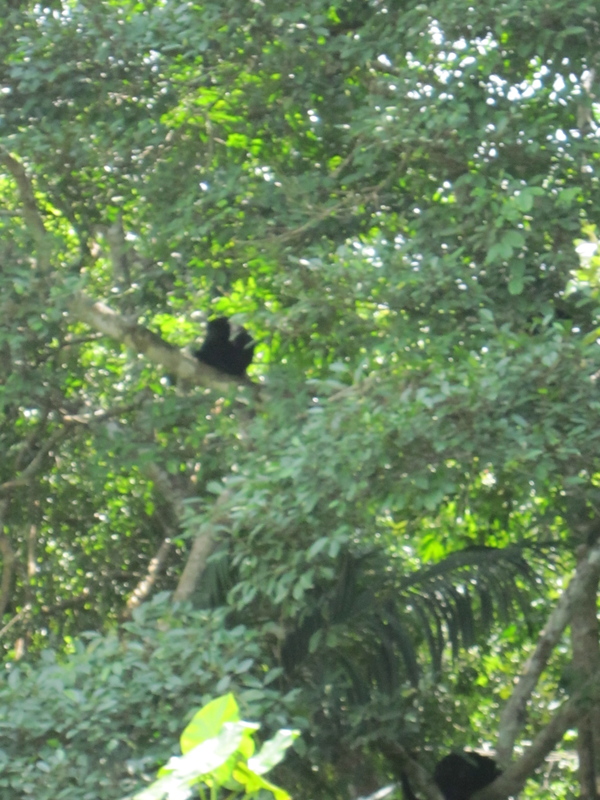 On my second morning I went on an excursion to the Gamboa Rainforest Resort. 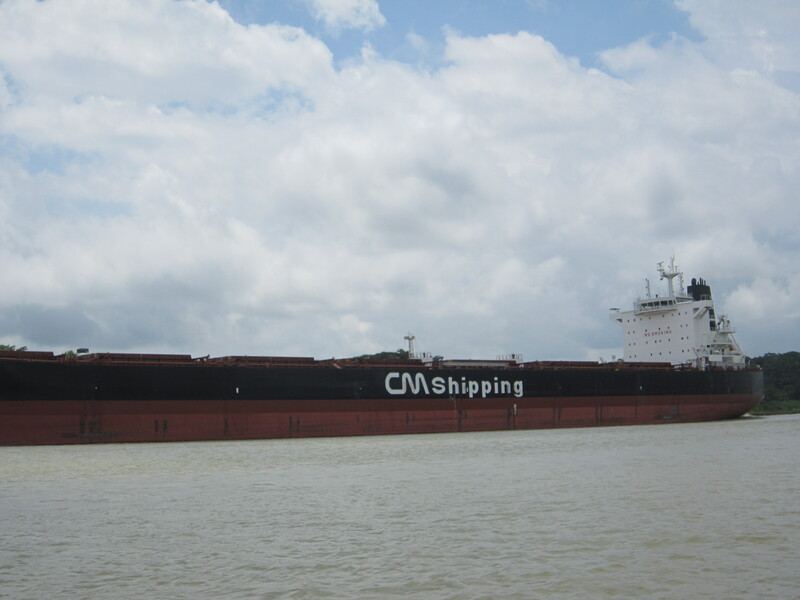 The small town of Gamboa is located in the formerly American-governed Canal Zone and is about a 30-45 minute drive from Panama City. I was going to take a taxi, but for $10. more my hotel concierge suggested that I hire a driver/tour guide, and it was definitely worth it. My driver and guide Luciano Granie drove me through a few of the former U.S. Canal Zone towns (Ancón, Balboa and Gamboa) and pointed out places of interest like the old YMCA, an English-language church, a French colonial cemetery, and the jail where Noriega is currently living out his days. It was interesting to see the architecture of the old “Zonian” (American) wooden bungalows and the English street names. 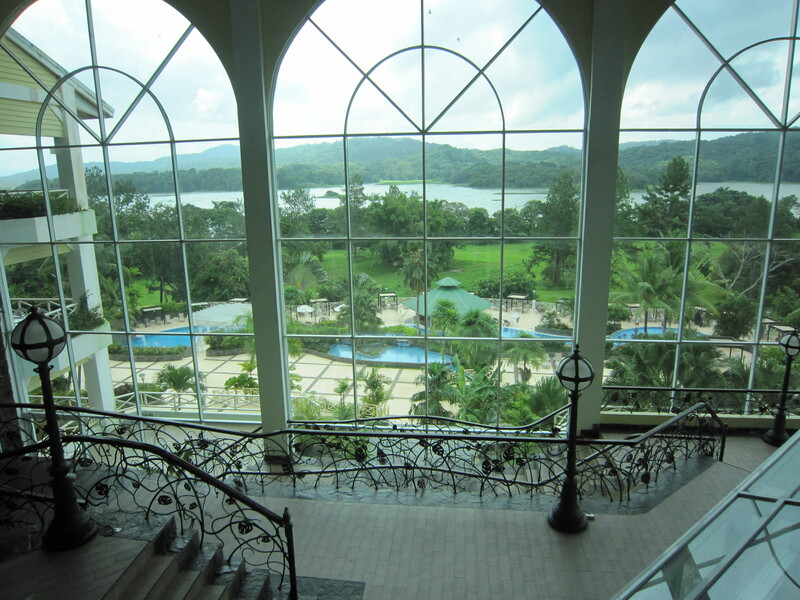 The Gamboa Rainforest Resort is a beautiful resort located on the Panama Canal and inside of the Soberania National Park. 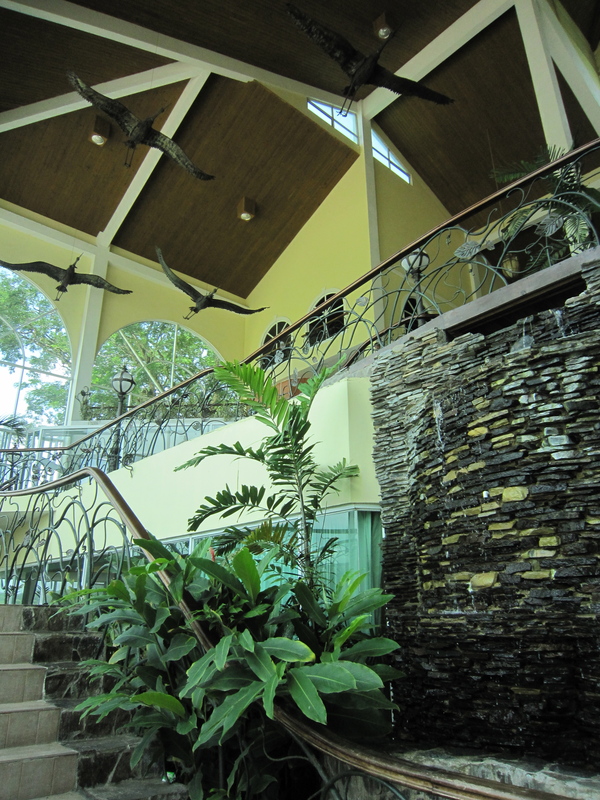 They offer a variety of nature activities for guests or day visitors, such as birdwatching, boat tours, and an aerial tram tour (in addition to a Clarins spa). 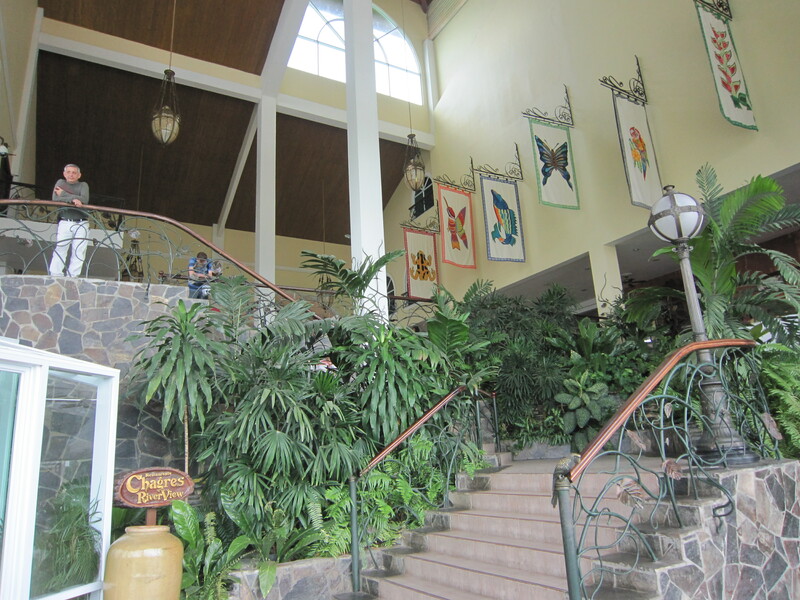 Apparently the historic-looking main building of the resort is new-ish (c. 2000), but the wooden “villas” (AKA bungalows) on the grounds date back to the 1930’s and were previously the homes of American Canal Administration officers. 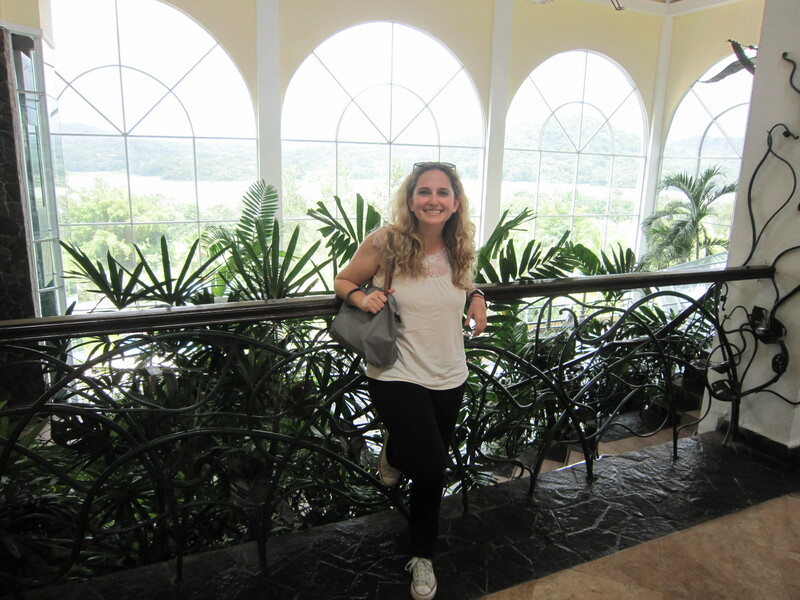 I had wanted to visit the resort since watching the Samantha Brown Panama episode where Samantha visits the hotel and goes on a boat tour of the nearby animal sanctuary Monkey Islands. 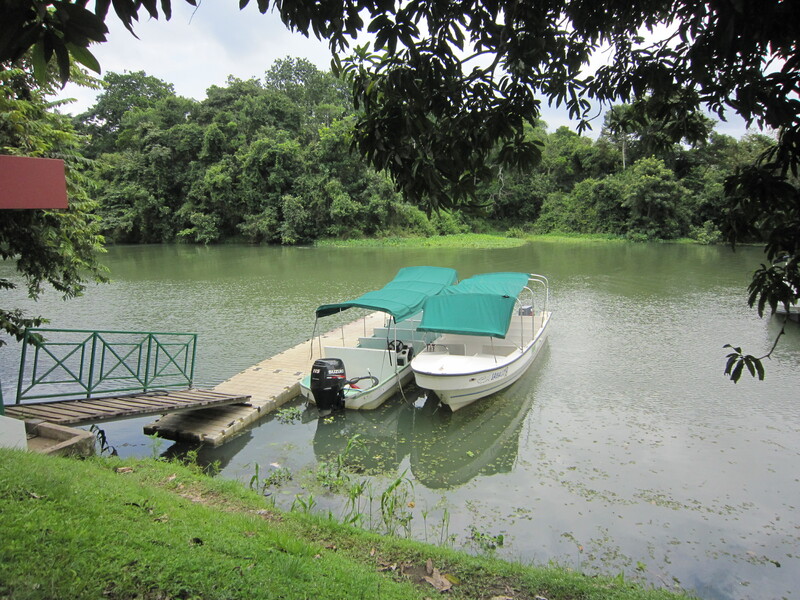 I bought a ticket for the Gatun Lake Exploration tour, which included viewing the Monkey Islands in the description. 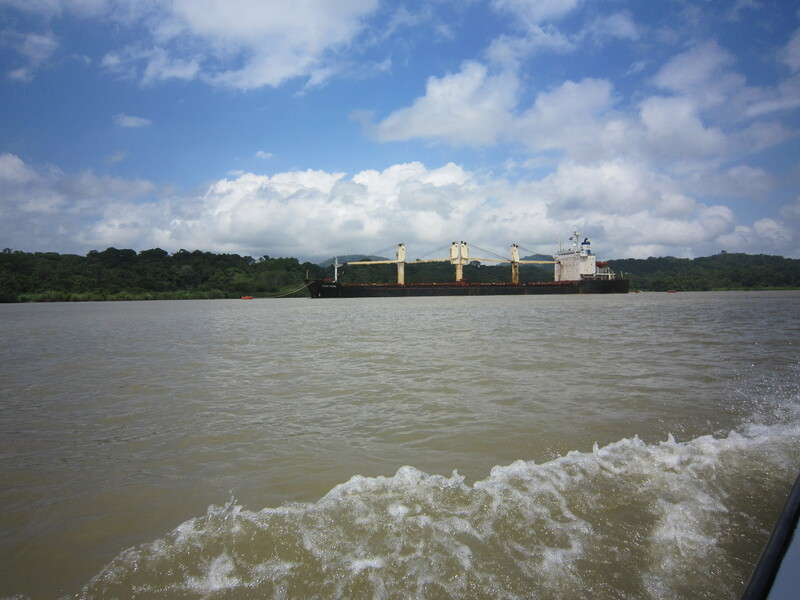 The one-hour boat tour took us through Gatun Lake, which is a huge man-made lake that serves as one of two water sources for the Panama Canal. 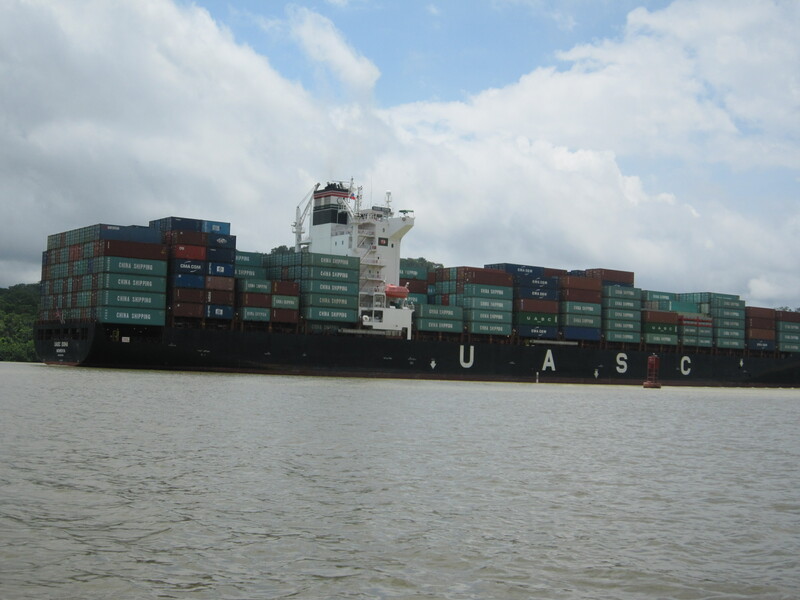 We saw a lot of gigantic Chinese freight ships from the Canal. 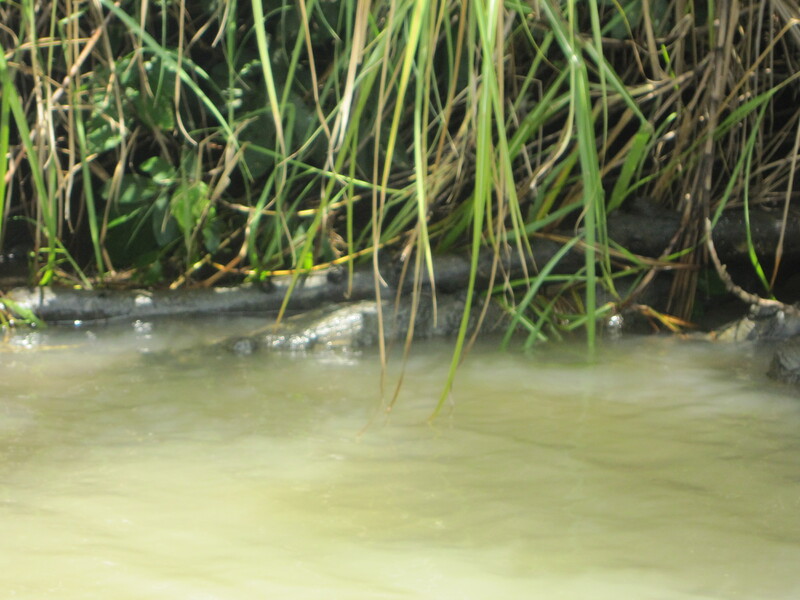 We did, however, see several alligators and an iguana (not cute). When the tour finished, I thought about having lunch at the resort, but I heard the restaurants were overpriced and not that great. 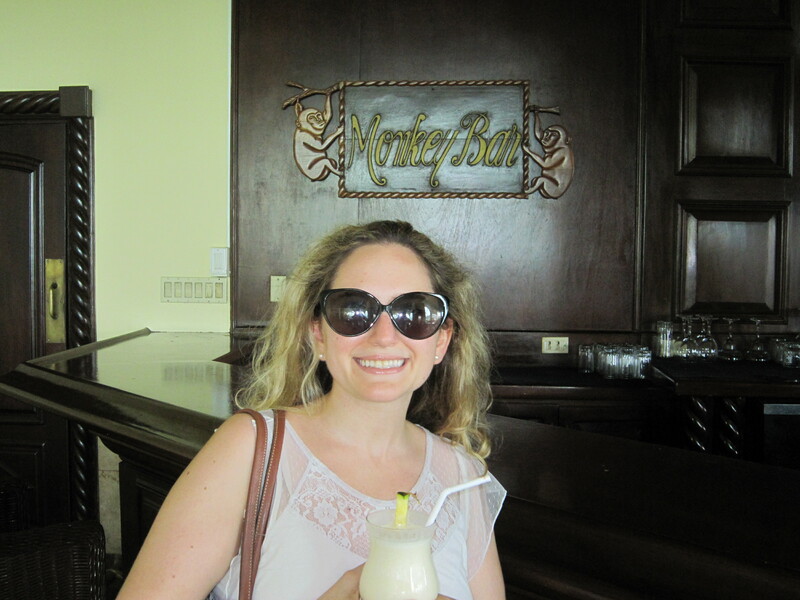 Instead I decided to have a drink at the Monkey Bar to make up for the low number of monkey sightings (I will say that the bar had a reasonably priced menu, but I wasn’t in the mood for fried bar-ish food). 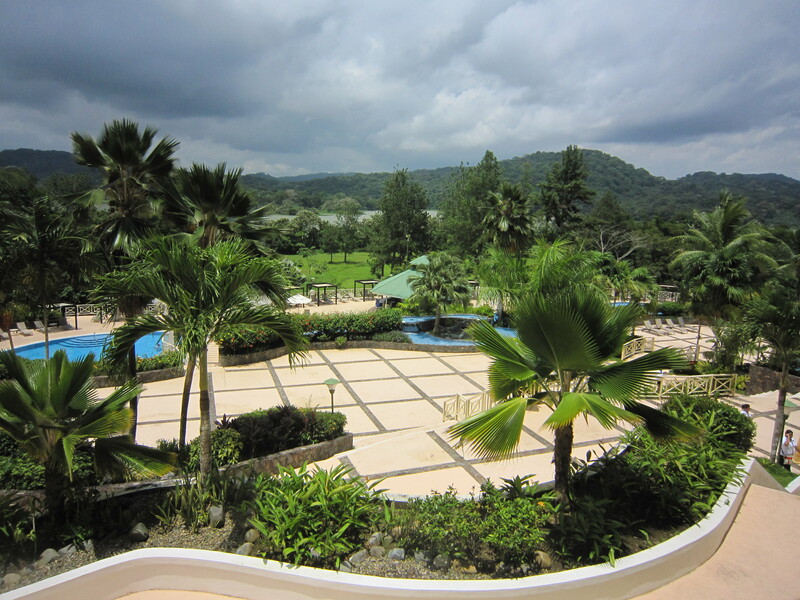 Happy to be at the Gamboa Rainforest Resort! After my cocktail, Luciano drove me back to the city and dropped me off at my next requested stop, which will be covered in Panama post #4. 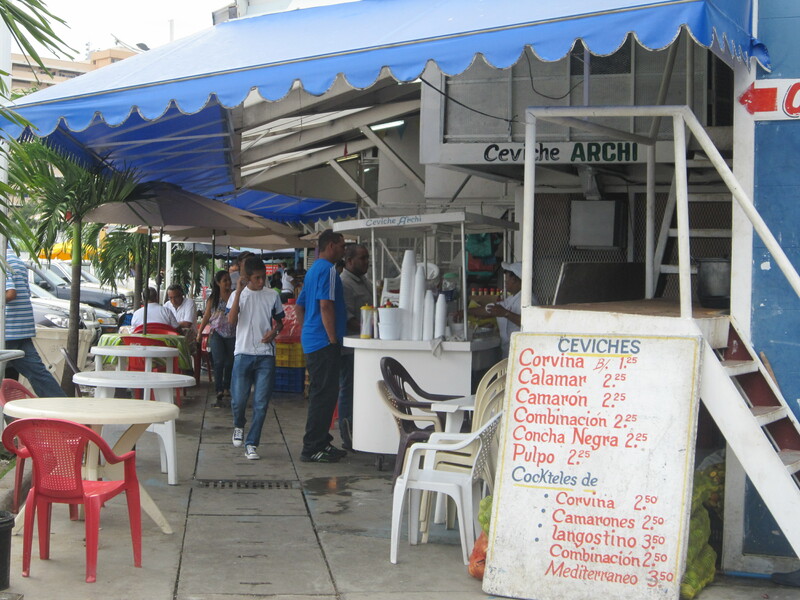 As mentioned in my previous Panama post, on my first morning I took a walk around the El Cangrejo neighborhood, which is where my hotel was located (along with most of the city’s hotels). 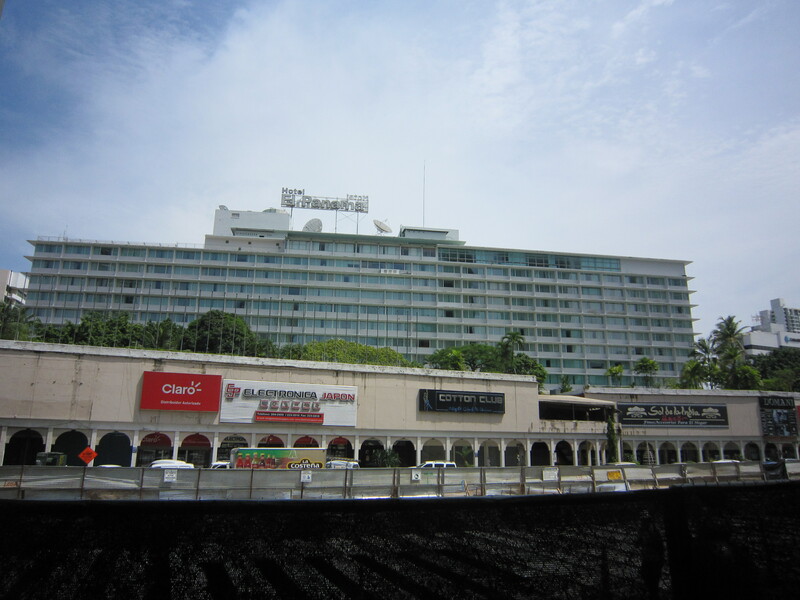 The area was a nice mix of residential buildings, stores, hotels and casinos, though I have to admit I found the architecture disappointing. 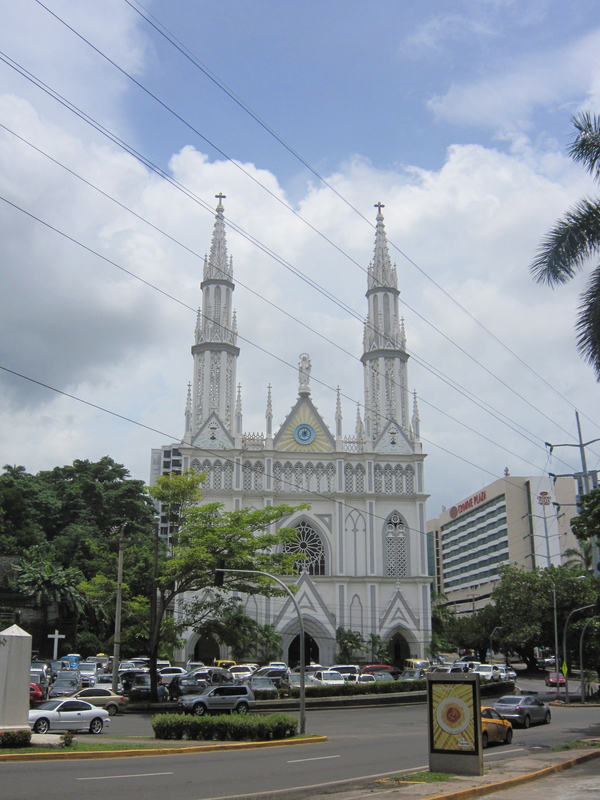 The gorgeous latticework strewn Iglesia del Carmen was the only building that stood out in my mind as being exceptional. 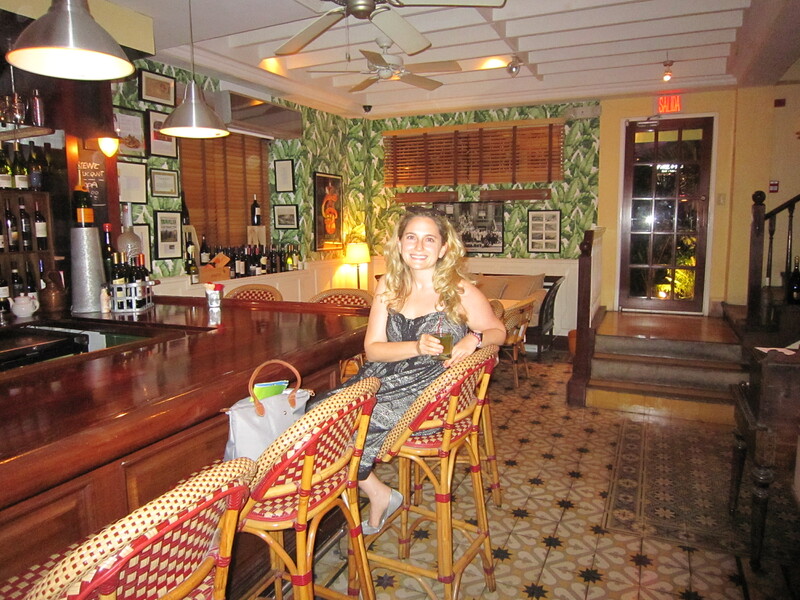 As someone who loves visiting historic hotels, I also found the city’s hotels to be a letdown. There were some very upscale hotels like the Rui and Le Meridien, but they were all new and glitzy looking rather than grand and elegant. Even the city’s oldest hotel El Panama was renovated to look like a home furnishing catalog – nice, but completely lacking style. 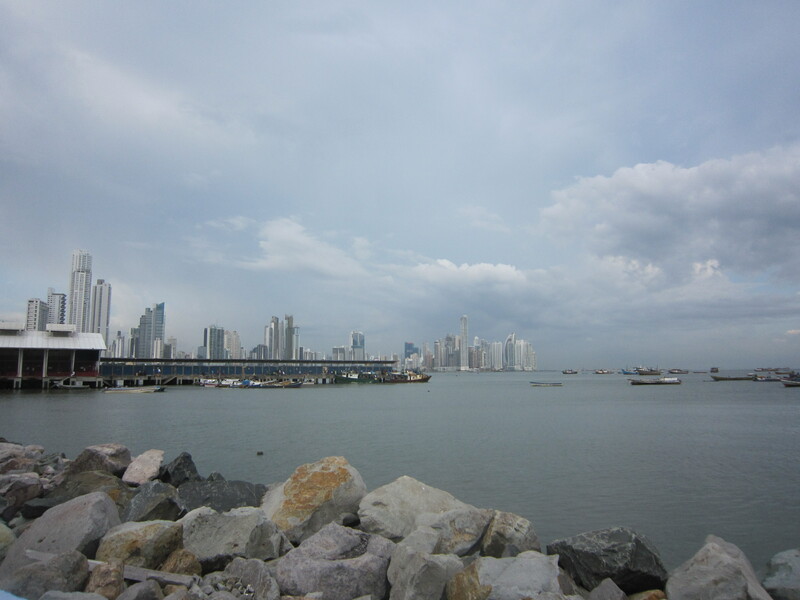 On my walk around El Cangrejo I also got a preview of what I would see all over Panama City: construction, construction, construction! There was literally a work site on every other block. I have never seen anything like it! Unlike in NYC, there were rarely walkways around the construction sites, so you just had to walk in traffic. I am curious to know how many tort cases are filed per year because there are so many accidents waiting to happen. On a more positive note, other than the many construction sites, I felt quite safe walking around El Cangrejo, which was most important! After going on the previously described historic trolley tour of the city, I had a late lunch in the neighboring area of Marbella. I ate at my favorite Columbian chain, Crepes & Waffles, which sadly seemed much better in Columbia. It started pouring as I got to the restaurant, but luckily I missed it, which was a common theme of the trip since it rained every afternoon for about an hour or less. Following lunch I explored Marbella, though the 92 degree heat and extreme humidity made it a bit unpleasant. No, this isn’t an art museum. 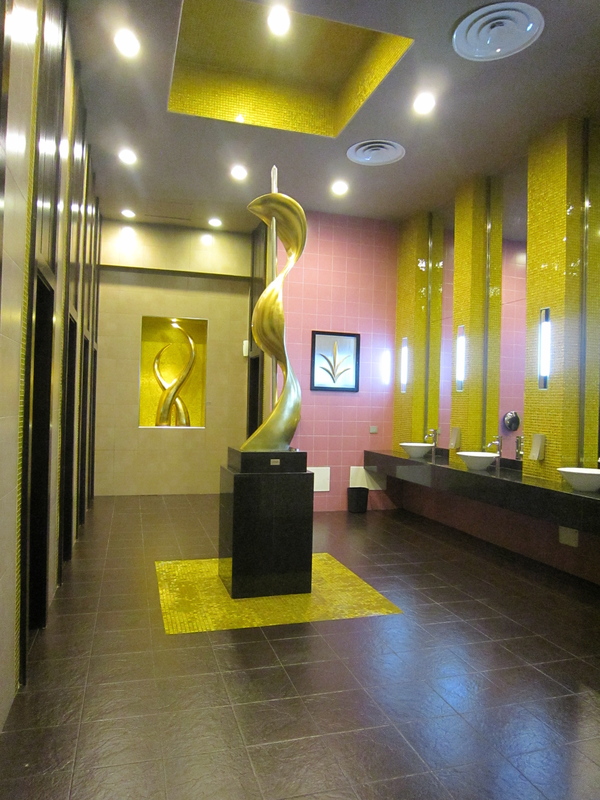 Hint: notice the stalls…it’s the bathroom at the Rui Hotel! The tiles looked golden in person. I returned to my hotel to rest and shower before dinner. 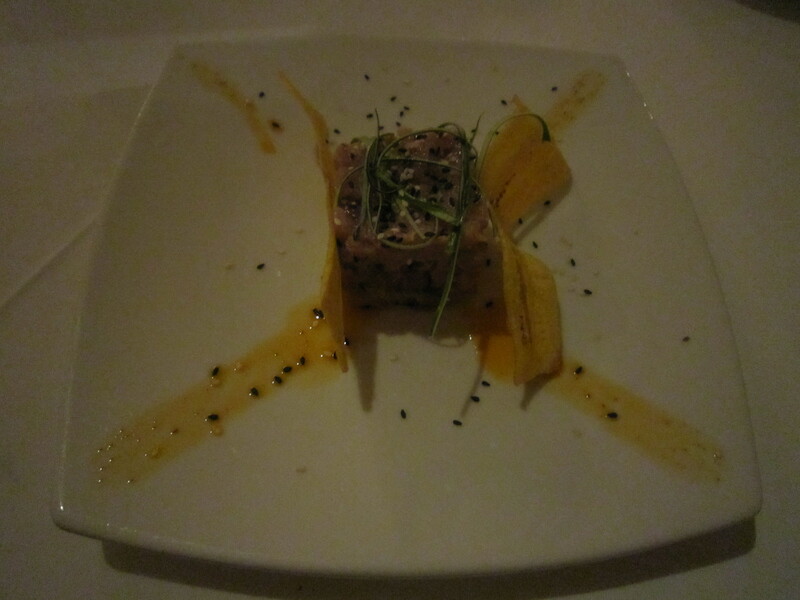 I then took a taxi back to Marbella to eat at La Posta, which is considered one of the city’s most popular restaurants. I can definitely see why! 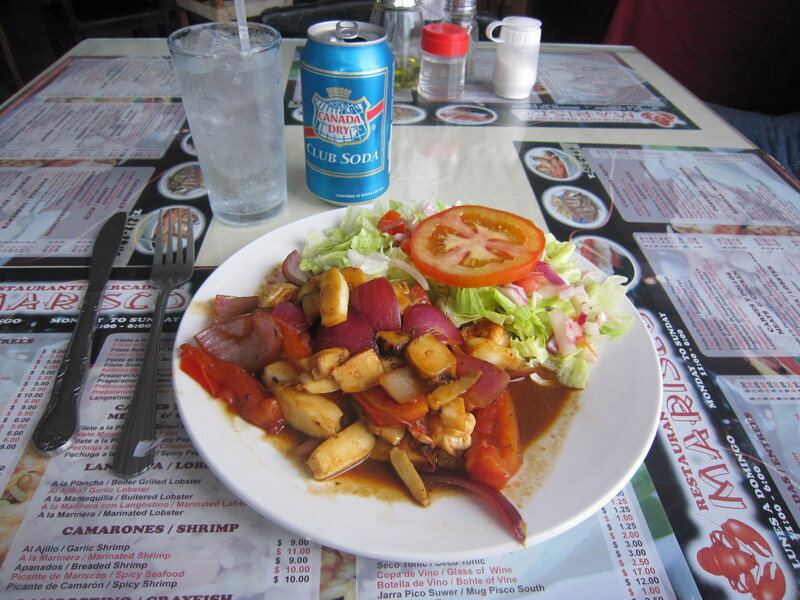 The food was Latin American-European fusion and was exquisitely presented. 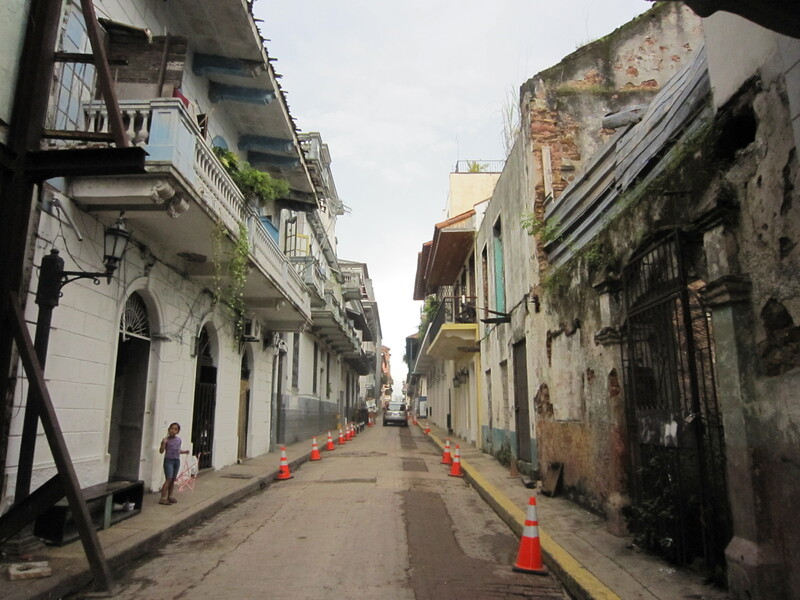 I also loved the atmosphere, which was evocative of old Cuba. 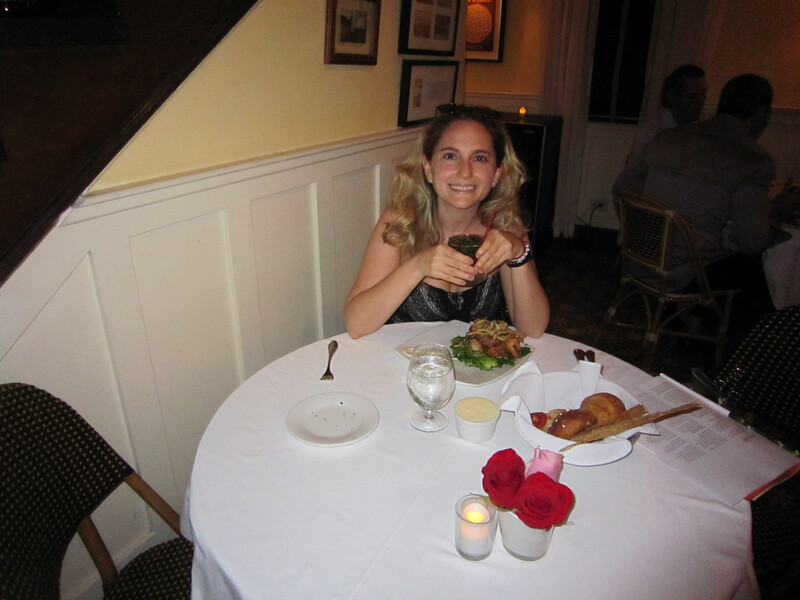 The waiters wore guayabera shirts and were very attentive. My table featuring an outstanding bread basket, fried shrimp and eggplant dish, and a complimentary mojito. 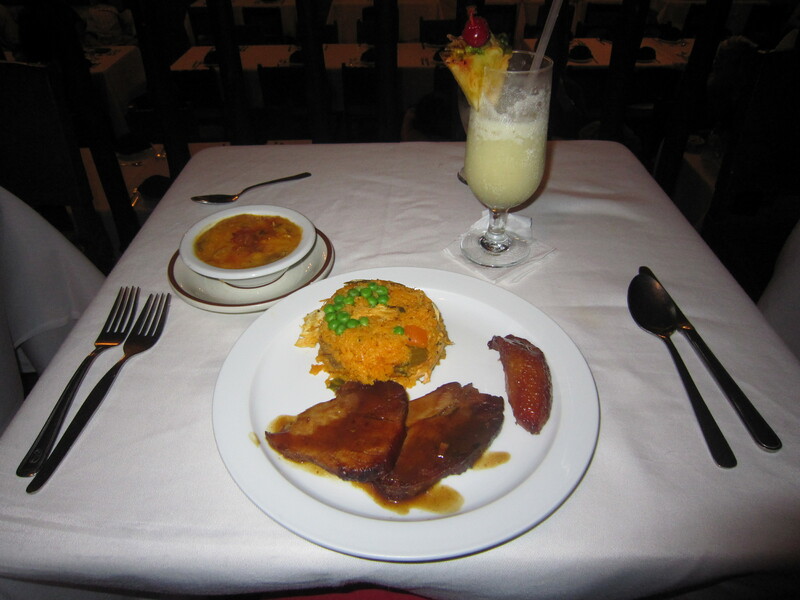 The best thing I ate in Panama. 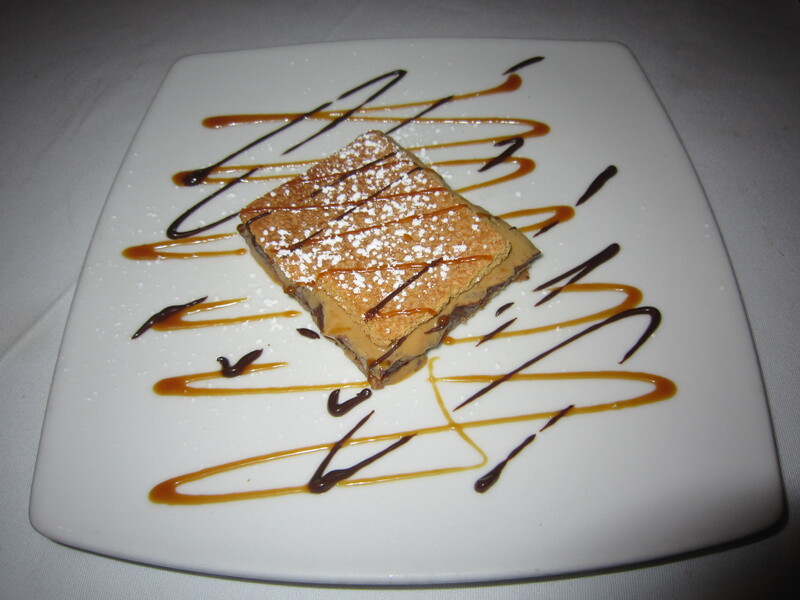 This was a dulce de leche/brownie creation, which was described as an alfajore (note – it looked nothing like an Argentine alfajore, but it was equally delicious!). After dinner I decided to call it an early night so that I would be well rested for my day 2 excursion to the Gamboa Rainforest Resort.